Last Friday, I wrote a post about the book of Jonah, asserting that America plays the role of Nineveh in that story, not the role of Jonah (as we like to tell ourselves.) Today, I want to follow that up with a little theological grounding for that idea. I’m doing this because I can hear folks asking, how can I equate us with Assyria and people from places like Iran or Syria with Jonah, when those people aren’t Christians, or even Jewish? Why would God side with Muslims over us, even if, as a nation, we haven’t always acted very Christian in our foreign relations? The answer is found in thinking about the relation of humanity to God, and specifically, the fundamental orientation of that relationship. In the telling where America plays the good guy role here, the assumption is made of a Divine-Human relationship where we get to set the terms. From us emanates truth, and all else swirls around us and is described in relation to us. America is good, not on God’s terms, but on our own terms. In this telling, the great fundamentalist fear comes to fruition: truth is made relative, in this case, to the needs of American imperialistic aims. The way of God is made unimportant; instead, the way of America is the guiding lodestar. 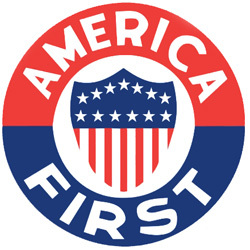 America First becomes not just a quasi-racist catchphrase, but a theological assertion of primacy. But this gets the human-Divine relationship backwards. When speaking of God – the Divine, the Ground of All Being, Ultimate Truth – one exists in relation to God, is defined by one’s relationship to the Divine. Paul Tillich writes of the “subject-object distinction,” asserting that God can never be an object in an object-subject relation, but is always the subject. This argument can be problematic at times, especially when the subjective God is conceived of by human beings as a capricious, angry and self-obsessed God. This subject God, around whom all else orbits, becomes “Anti-humanistic,” a God with little if any concern for humanity, but instead completely caught up in God’s own whims and desires. Humanity’s actions and existence become by-products of God, rather than objects. The subject-object relation breaks down in this case. God as subject works, though, when we understand God as concerned with humanity, and especially, as Jesus posited, with the “least of these.” This is one of the primary and most important contributions of liberation theology to the conception of God: a God concerned primarily with the oppressed, who stands on the side of those not in positions of power. That’s what powers my assertion that America is playing the role of Nineveh, and persons in places like Iran or Iraq or Afghanistan are playing the role of Jonah. Because God takes the side of the oppressed. And in the case of American imperialism in the Middle East, the oppressed are the people in those places who are being bombed and terrorized and killed. God sides with them, no matter their religion, no matter their creed, and no matter their nationality. In cases where unjust power in being brought to bear, God could really care less about any temporal identifiers. God cares about the flourishing of human life, in its many varied forms. God takes the side of the indigent peasant farmer before he takes the side of well-fed suburbanites in conflict between the two. Too often, America plays the role of oppressor to peoples in the global south and east, especially poor people of color. We do it for well-reasoned “good” ideas, like democracy or liberty. But always, these are justifications that benefit not in solidarity with others, but at the expense of them. This is where I get my grounding the say: in Jonah, we are Nineveh. I have very little doubt about that. I saw this headline the other day, while scrolling through Facebook. Like so, so, so many things having to do with our President, it made me angry, it offended my sensibilities as an American, a Christian, and a human being, and most of all, it just made me sad. But it also made me think about the story of Jonah. Anyone who grew up in Sunday school knows the broad contours of the story. God tells Jonah to do something, Jonah disobeys and runs away from God, a big fish (maybe a whale?) swallows Jonah for three days, during which time Jonah decides he’s sorry for disobeying God, the fish spits him out and Jonah goes and does what we he was told. In this version of Jonah, the story is all about obedience and disobedience, not just of God, but also of our parents, our teachers, or really, any authority figure. Obedience to authority is a pretty important value for most parents, and this seems like a tailor made tale for teaching such a lesson. But, this is a really shallow way to read the story of Jonah. There is a lot more going on here. There are a lot of different lessons to learn from this little book, and a lot better contemporary issues to apply those lessons to than whether or not Johnny is listening when Mom tells him no cookies before dinner. Like, for instance, American imperial hegemony in the Middle East. Jonah is a story that is obliquely about imperial hegemony in the ancient Middle East; in this case, Assyria is the hegemon. God asks Jonah to go to Nineveh, Assyria’s capital, to deliver a message of impending judgement and possible redemption to the Assyrians. And Jonah really, really doesn’t want to. Why is that? Because if you imagine Jonah being an American (and that’s a really problematic assumption we’ll return to), then the ancient Assyrians were like Iran, ISIS, or maybe more accurately, like imperial Japan. They had a mission of global conquest, and they were constantly attacking and invading ancient Israel. Over the course of a century, they invaded Israel at least three times, capturing the northern capital of Samaria, carrying it’s people off to captivity, and besieging Jerusalem. So the Israelites really, really didn’t like the Assyrians. You can open to just about any pre-exilic prophet in the Old Testament and find some condemnation and judgement from God for Assyria. and now I imagine you aren’t thinking this sounds like a good idea at all. You’d run away too, I imagine. Bless the Iranians? Or ISIS? Or imperial Japan? Make them a great nation? Not cool. They’ve all done some pretty terrible things, invaded places and beheaded people and made life pretty difficult for us. The destruction part sounds good, but the blessing, not so much. But that’s the point. This story isn’t about obedience and disobedience (at least, not primarily.) Rather, this is a story about the universality of God’s redeeming love. As much as we want to think God’s love is mostly reserved for us good, church-going, tithe-paying Christians, it is simply not. God’s love, as we find in so many places in the Bible, cannot be contained or rationed. It extends to any and all people, no matter their transgressions, no matter their background or creed or problems. God showed love to tax collectors, to persecutors, to murderers, and even to Nineveh. So, chances are good that God also loves ayatollahs and jihadis and kamikaze bombers, just as much as he loves Presbyterians and Baptists and Methodists. And that’s some really good news for us Americans, too. Because we need it. Remember above, when we imagined Jonah as an American and I said that was a problem and we’d come back to it? Well, we are coming back to it. Because, as much as we want to read a story like Jonah and imagine ourselves the hero, the fact is, we really aren’t. In fact, in this case, America is more like Assyria. Jonah isn’t getting sent from Akron to Aleppo. Most likely, Jonah is getting sent from Jalalabad to Washington, to deliver a warning of destruction and opportunity for repentance to us. In America, we are the ones in need of God’s love and grace. And that brings me back to that headline. 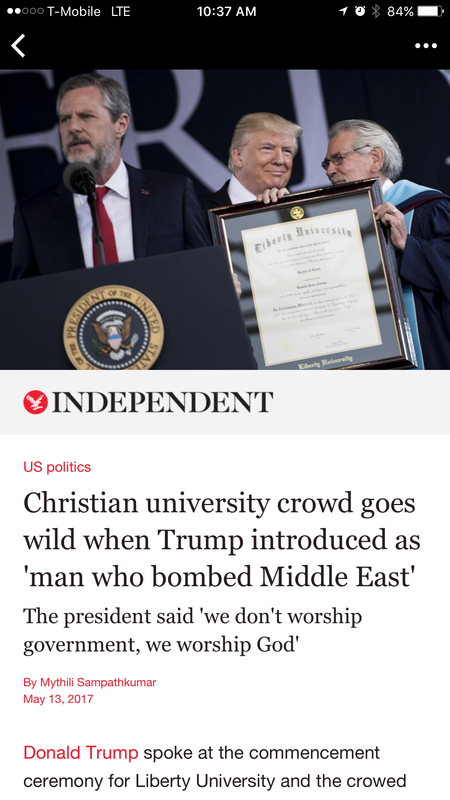 It’s really gross and disgusting to see an arena full of self-proclaimed followers of the Prince of Peace cheering wildly at the idea of bombing the very part of the world that Prince hailed from. It’s also nothing new; America Christians were the biggest, most fervent supporters of an unprovoked war in Iraq, for death-dealing forays into Central America in the 80s, for the ill-fated effort to combat communism in Vietnam. This news item is only the most recent, and most blatant, example of the American-Christian war machine. And it is so blatant this time because we’ve been taught and conditioned for so long to associate the glory of Christianity with the success of American imperial power. News flash: that’s not the Gospel. That’s kind of the anti-Gospel. So, in the book of Jonah, we don’t get to play the part of Jonah. Instead, we are imperial Assyria, conquering Israel and carrying the people off and besieging their capital. We are the ones God’s anger is kindled against, the ones in danger of destruction, the ones in need of redemption. In the book of Jonah, the Assyrians hear Jonah’s message. They repent. They wear sackcloth and cry out to God and are saved. They shelf their imperial arrogance and hubris, admit that being the biggest, most powerful country on earth, with the biggest, baddest military and the most money and the biggest egos hasn’t served them very well. Let’s hope our Jonah shows up soon. Let’s hope we pay attention.